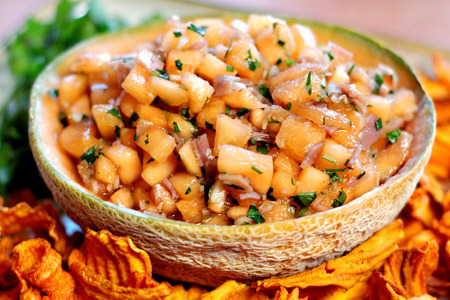 Here's a funky sweet and savory salsa that makes use of the well-known flavor marriage of cantaloupe and prosciutto. I served it with some sweet potato and carrot chips, but I think it would be outstanding atop a nice piece of grilled mild fish. It might also be a good accessory to a grilled salad. Cut the cantaloupe in half and seed it. Note: If you don't want to use the rind as bowl, skip the next three steps. 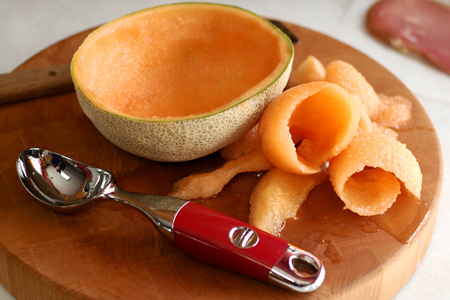 Use an ice cream scoop to remove all but about 1/4" of the flesh from one half of the melon, as shown. Set the flesh aside. If the hollow rind won't sit upright on its own, cut a small sliver off of the bottom center to make a flat spot. Put the rind bowl in a large zip-top bag and freeze it. 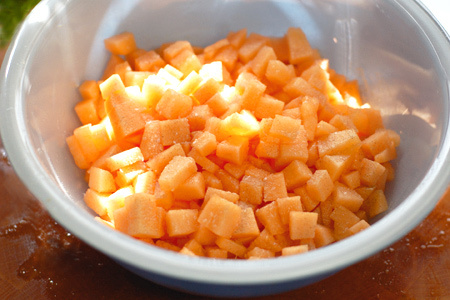 Cut all of the melon to a medium dice and put it in a large mixing bowl. Chop the prosciutto to approximately 1/4". Mince the shallot and chop the parsley (medium - you need about 1/3 cup). Note: This kind of prep work is where the uber-cheap and scary-sharp Kiwi knives really shine. They are prep machines! 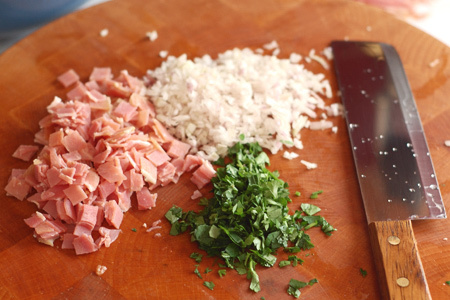 Add the prosciutto, shallot, parsley, salt and pepper to the mixing bowl. 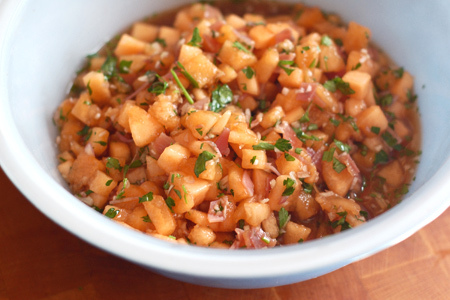 Whisk the vinegar and honey together in a small bowl, then add it to the melon. Mix the salsa well, cover and refrigerate at least two hours, stirring occasionally. YUM! That looks delicious!! I'll totally be trying this one out. Now that is a nice salad! 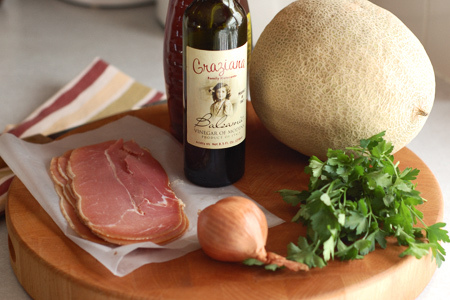 The salty prosciutto goes really well with the sweet melon.